The Arctic Tern (Sterna paradisaea) is a seabird of the tern family Sternidae. This bird has a circumpolar distribution, breeding colonially in Arctic and sub-Arctic regions of Europe, Asia, and North America (as far south as Brittany and Massachusetts). The species is strongly migratory, seeing two summers each year as it migrates from its northern breeding grounds to the oceans around Antarctica and back each year. This is the longest regular migration by any known animal. Arctic Terns are medium-sized birds, with a length of 33-39 centimetres (13-15 in) and a wingspan of 76-85 cm (26-30 in). They are mainly grey and white plumaged, with a red beak (as long as the head, straight, with pronounced gonys) and feet, white forehead, a black nape (back of the neck) and crown (streaked white) , and white cheeks. The gray mantle (back) is 305 mm, and the scapulars (shoulder feathers) are fringed brown, some tipped white. The upper wing is gray with a white leading edge, and the collar is completely white, as is the rump. The deeply forked tail is whitish, with grey outer webs. The hindcrown to the ear-coverts is back. The Arctic Tern is K-selected, caring for and aggressively defending a small number of young. Parents feed them fish for a considerable time, and help them fly south to winter. Arctic Terns are long-lived birds, with many reaching twenty years of age. They eat mainly fish and small marine invertebrates (= animals without internal skeleton). The species is abundant, with an estimated one million individuals. While the trend in the number of individuals in the species as a whole is not known, exploitation in the past has reduced this bird's numbers in the southern reaches of its range. The Arctic Tern has a worldwide, circumpolar breeding distribution which is continuous; there are no recognized subspecies. It can be found in coastal regions in cooler temperate parts of North America and Eurasia during the northern summer. While wintering during the southern summer, it can be found at sea, reaching the southern edge of the Antarctic ice. The area of the range of the species is approximately ten million square kilometers. The Arctic Tern is famous for its migration; it flies from its Arctic breeding grounds to the Antarctic and back again each year. This 19,000 km (12,000 mi) journey ensures that this bird sees two summers per year and more daylight than any other creature on the planet. The average Arctic Tern in its life will travel a distance equal to going to the moon and back. One example of this bird's remarkable long-distance flying abilities involves an Arctic Tern ringed as an unfledged chick on the Farne Islands, Northumberland, UK in summer 1982, which reached Melbourne, Australia in October 1982, a sea journey of over 22,000 km (14,000 mi) in just three months from fledging. 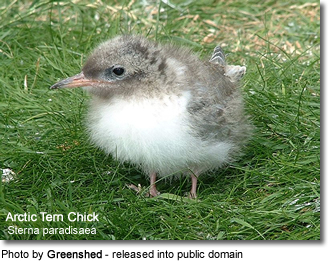 Another example is that of a chick ringed in Labrador on 23 July 1928. It was found in South Africa four months later. Arctic Terns usually migrate far offshore. Consequently, they are rarely seen from land outside the breeding season. 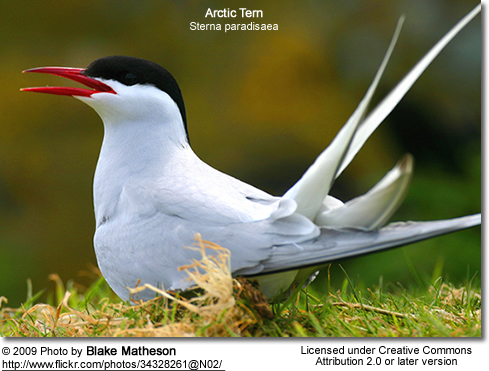 The Arctic Tern is medium-sized bird approximately 33-36 cm (13-15 in) from the tip of its beak to the tip of its tail. The wingspan is 76-85 cm. The weight is 86-127 g (3.0-4.5 oz). The beak is dark red, as are the short legs and webbed feet. 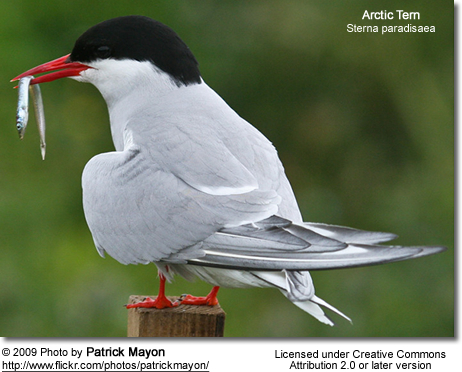 Like most terns, the Arctic Tern has high aspect ratio wings and a tail with a deep fork. The adult plumage is grey above, with a black nape (back of the neck) and crown and white cheeks. The upperwings are pale grey, with the area near the wingtip being translucent. The tail is white, and the underparts pale grey. Both sexes are similar in appearance. The winter plumage is similar, but the crown is whiter and the bills are darker. Juveniles differ from adults in their black bill and legs, "scaly" appearing wings, and mantle (back) with dark feather tips, dark carpal wing bar, and short tail streamers. During their first summer, juveniles also have a whiter forecrown. The species has a variety of calls; the two most common being the alarm call, made when possible predators (such as humans or other mammals) enter the colonies, and the advertising call. The advertising call is social in nature, made when returning to the colony and during aggressive encounters between individuals. It is unique to each individual tern and as such it serves a similar role to the bird song of passerines, identifying individuals. Eight other calls have been described, from begging calls made by females during mating to attack calls made while swooping at intruders. While the Arctic Tern is similar to the Common and Roseate Terns, its colouring, profile, and call are slightly different. Compared to the Common Tern, it has a longer tail and mono-colored bill, while the main differences from the Roseate are its slightly darker colour and longer wings. The Arctic Tern's call is more nasal and rasping than that of the Common, and is easily distinguishable from that of the Roseate. This bird's closest relatives are a group of South Polar species, the South American (Sterna hirundinacea), Kerguelen (S. virgata), and Antarctic (S. vittata) Terns. On the wintering grounds, the Arctic Tern can be distinguished from these relatives; the six-month difference in moult is the best clue here, with Arctic Terns being in winter plumage during the southern summer. The southern species also do not show darker wingtips in flight. Arctic Terns mate for life, and in most cases, return to the same colony each year. Breeding begins around the third or fourth year. Courtship is elaborate, especially in birds nesting for the first time. Courtship begins with a so-called "high flight", where a female will chase the male to a high altitude and then slowly descend. This display is followed by "fish flights", where the male will offer fish to the female. Courtship on the ground involves strutting with a raised tail and lowered wings. After this, both birds will usually fly and circle each other. Both sexes agree on a site for a nest, and both will defend the site. During this time, the male continues to feed the female. Mating occurs shortly after this. Breeding takes place in colonies on coasts, islands and occasionally inland on tundra near water. It often forms mixed flocks with the Common Tern. It lays from one to three eggs per clutch, most often two. It is one of the most aggressive terns, fiercely defensive of its nest and young. It will attack humans and large predators, usually striking the top or back of the head. Although it is too small to cause serious injury, it is capable of drawing blood. Other birds can benefit from nesting in an area defended by Arctic Terns. The nest is usually a depression in the ground, which may or may not be lined with bits of grass or similar materials. The eggs are mottled and camouflaged. Both sexes share incubation duties. The young hatch after 22-27 days and fledge after 21-24 days. If the parents are disturbed and flush from the nest frequently this has the effect of extending the incubation period to as long as 34 days. When hatched, the chicks are downy. Neither altricial nor precocial, the chicks begin to move around and explore their surroundings within one to three days after hatching. Usually, they do not stray far from the nest. Chicks are brooded by the adults for the first ten days after hatching. Both parents care for hatchlings. Chick diets always include fish, and parents selectively bring larger prey items to chicks than they eat themselves. Males bring more food than females. Feeding by the parents lasts for roughly a month before being weaned off slowly. After fledging, the juveniles learn to feed themselves, including the difficult method of plunge-diving. They will fly south to winter with the help of their parents. Arctic Terns trend towards K-selection; they are long-lived birds with few young raised each year compared to many land birds. The maximum recorded lifespan for the species is 34 years. A lifespan of twenty years may not be unusual, with a study in the Farne Islands estimating an annual survival rate of 82%. The diet of the Arctic Tern varies depending on location and time, but is usually carnivorous. In most cases, it eats small fish or marine crustaceans. Fish species comprise the most important part of the diet, and account for more of the biomass consumed than any other food. Prey species are immature (1-2 year old) shoaling species such as herring, cod, sandlances, and capelin. Among the marine crustaceans eaten are amphipods, crabs and krill. Sometimes, these birds also eat mollusks, marine worms, or berries, and on their northern breeding grounds, insects. 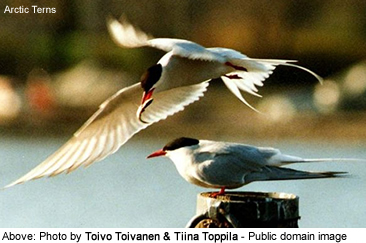 Like all Sterna terns, the Arctic Tern feeds by plunge-diving for fish, usually from the sea, though occasionally also fishing in coastal freshwater lagoons. It often dives from a "stepped-hover", in which it slowly flies into the wind at such a speed that it is stationary relative to the water. It will then dive and catch its prey, which it detects by sight. Arctic Terns sometimes dip down to the surface of the water to catch prey close to the surface. They may also chase insects in the air when breeding. It is also thought that Arctic Terns may, in spite of their small size, occasionally engage in kleptoparasitism by swooping at birds so as to startle them into releasing their catches. Several species are targeted—conspecifics, other terns (like the Common Tern), and some auk and grebe species. 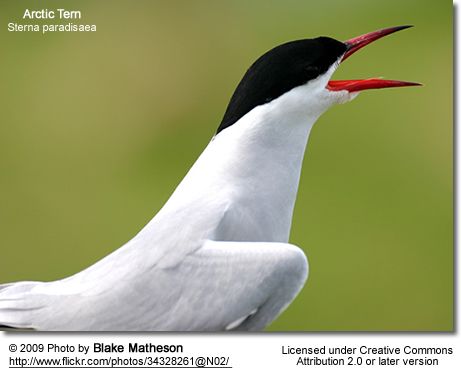 While nesting, Arctic Terns are vulnerable to predation by rats and other animals. Besides being a competitor for nesting sites, the larger Herring Gull steals eggs and hatchlings. Camouflaged eggs help prevent this, as do isolated nesting sites. While feeding, skuas, gulls, and other tern species will often harass the birds and steal their food. They often form mixed colonies with other terns, such as Common and Sandwich Terns. Arctic Terns are considered threatened or species of concern in certain states. They are also among the species to which the Agreement on the Conservation of African-Eurasian Migratory Waterbirds applies. The species declined in New England in the late nineteenth-century due to hunting for the millinery trade. Exploitation continues today in western Greenland, where the species has declined greatly since 1950. At the southern part of their range, the Arctic Tern has been declining in numbers. Much of this is due to shortages of food. However, most of these birds' range is extremely remote, with no apparent trend in the species as a whole. Birdlife International has considered the species to be at lower risk since 1988, believing that there are approximately one million individuals around the world.